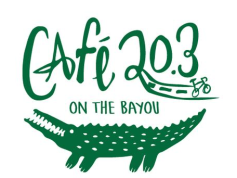 Cafe 20.3 on the bayou offers sandwiches, smoothies, coffee, beer, and more right on the Vermilion. It's Happy Hour Every Day! Ladies Night AND Free Beer! Thirsty Thursdays! -Get One free draft beer with the purchase of a burger or sandwich (dine in only) -Ladies Night: 2 for 1 house wine, draft beer, and well drinks beginning at 7 PM!